Much like a painter who just starts to paint and creates a unique piece of art, a good cook can whip up something by just starting to cook. I tend to make the best meals when I look at what’s lying around in my cabinets and refrigerator and just go for it. This happens because I have good cooking intuition. For example, one day I was feeling very hungry and knew I had to eat before my Pilates class, but I wasn’t in the mood to cook. However, when I opened my refrigerator my eyes immediately went to a container of spinach and a slightly wilted Portobello mushroom. Then I opened my freezer and saw a bag of frozen precut wonton dough. Eureka! I found it. I had onions and garlic that were lying around. Now, some people may not possess this kind of natural culinary instinct and therefore are not a very good cooks. They may try to follow a recipe and still get mixed results. Whether you are cooking on the fly like I do or if you are following a recipe good intuition will enhance the meal. The good news for those that don’t have this trait is that they can practice and improve on it. There are very simple things to do to develop this skill in your cooking. If one learns simple cooking techniques, studies recipes, cooking shows and cook books, tries different foods, and pays attention to ingredient combinations their intuition skill will luckily grow by leaps and bounds. This is exactly how I did it. Lightly beat egg with ¼ water. Put the flour into a bowl, in the center add the beaten egg and remaining water. Knead the dough to a smooth texture, until it moves away from the hand. Cover the dough and let it sit for 30 minutes. Roll the dough out thinly on a floured surface and cut into 3.5 (roughly) squares. Dough can be frozen or kept for several days in the refrigerator in a tightly closed container. Heat up a frying pan with a little oil, add onion and fry untill golden brown. Add mushrooms and simmer covered for about 10 minutes, so they release all the flavors. Season with salt and pepper and cook uncovered for few more minutes (until all pan juices evaporate). Blend mushrooms from the pan in small food processor (their pieces shouldn’t be thicker than 1/6″). Place a small amount of mushroom mixture into each square (if mushrooms too big cut with a knife). Seal each wonton in typical rosette shape (or other). Bring water to a boil and boil wontons until they float to the surface; then drain (if you have steamer I recommend it over boiling, steam wontons for about 3 minutes). Heat up a frying pan with a little oil, add garlic and fry until golden brown. Toss in spinach over garlic and heat until spinach is wilted. Add milk, season with salt to taste and blend all pan ingredients into a homogeneous semi-liquid sauce (If the sauce is too thin, reduce to low heat and simmer until become consistency of sauce). 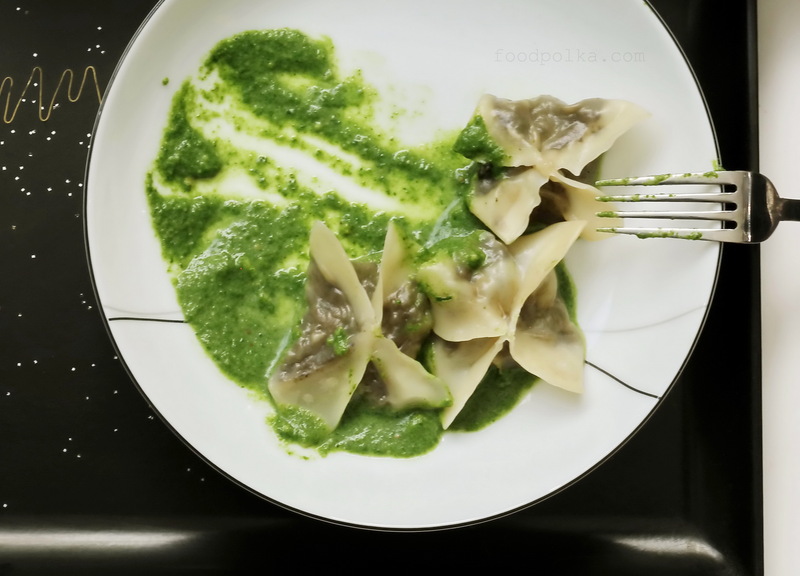 Plate wontons in a bowl with sauce and enjoy. I really didn’t feel like cooking. I was in one of those moods where the thought of cooking seemed too much of burden. I was going to stop at a place and grab something on my way to Pilates. But once I saw the wonton wraps the creativity started to pour out. When things like that hit me I get really excited. It was delicious and with the frozen wonton wraps the dish only took me a total of 30 minutes. So, remember to do some good cooking you don’t need time, you don’t need a recipe, you don’t need tons of ingredients just some intuition and some creativity. Enjoy your meal. 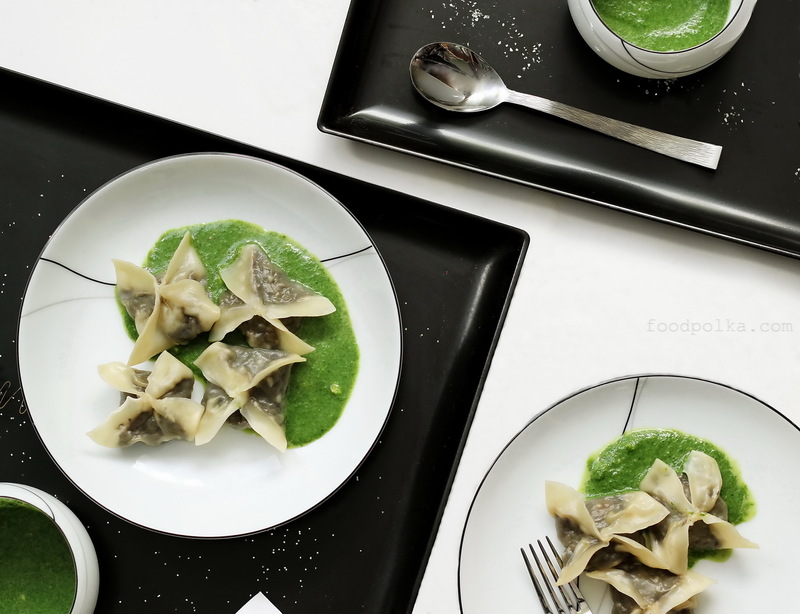 Have you ever made a polish traditional dumplings for your american friends? If yes, what they said about that? Yes, I have and they really liked it. But Pierogies are very popular in US, they sell them frozen with different stuffing just like in Poland. And they are very good.I love mushroom and sauerkraut pierogies the best!